On December 9th, endurance junkies from all ends of the country will be going Crazy for the 29th time as they line up for the Fine Signs Crazyman. But all eyes will be on a match up between two guys will the same name. In 2017 the Fine Signs Crazyman made history when Nelson’s teenager, Cameron Jones, became the youngest ever winner of a major multisport event. 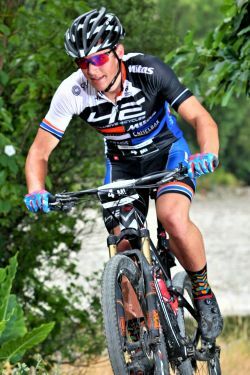 The 17-year-old overcame a six-minute deficit after the opening 13k kayak, riding through the field on the 28k mountain bike section and then holding off fellow Nelsonians Dan Busch and Patrick Higgins in 3hrs 48min 01secs. Lining up against the Nelsonian is two-time Crazyman winner and race record holder, Dan Jones. The 28-year-old will be lining up for a measure of retribution too. Last year he finished fourth behind his teenage name-sake (no relation) after falling out on the rough kayak section on Wellington Harbour. The Jones-boys will put on a good show too. The defending champion, Cameron, is very much a mountain bike specialist, while Dan is very much a run specialist. So the race for line honours could come down to the Petone Beach finish line. And the Fine Signs Crazyman is something worth achieving. On a course that is as spectacular as it is challenging, it kicks off with a 13k kayak from Days Bay in Eastbourne and heads along Wellington Harbour’s eastern coastline to Petone. Paddlers take in the historic Petone Wharf and finish in the lower reaches of the Hutt River at Sladden Park. At Petone they swap kayaks for mountain bikes for a 28k ride up the Hutt River trail and into Belmont Regional Park. The route takes in a hidden tunnel and creek crossings, then peaks out for staggering views from the volcanic rock strewn Boulder Hill, before passing historic WWII ammunition bunkers to finish on dedicated mountain bike trails at the historic Stratton Street Woolshed. Bikes are then swapped for running shoes for the 13k trail run over the edge of Belmont Hill and down the bush-clad Korokoro Stream. Following a trail that was first used by Maori in pre-European times, this run is as historic as it is spectacular and eventually finishes on Petone Foreshore.